Kyle sent this to me in a Gmail and I really appreciate it. It warms my heart that Candadians are writing tribute songs to the troops serving so valiantly in Afghanistan. Terry Draper from Klaatu and now this. I think it's about time for Stompin' Tom, a Proud Canadian, to come out with one. That would be great. A friend of mine, who was in our first band together back in the day, and I, are in the midst of writing our own tribute tunes. The Highway of Heroes phenomenon that sprung up spontaneously is so very, very moving. It has been recognized in Britain, Australia and the US as fitting way to honour our Fallen Warriors. A beautiful outpouring of support and grief for the families and friends of their Soldiers. Terry Draper of Klaatu presents his song Highway of Heroes, complete with bagpipes and marching drums. This song is dedicated to our lost soldiers and their families and friends. Vocals by Helena Kameka. I love the bagpipes.Great song Terry. Private Sébastien Courcy died while conducting operations in the Panjwayi District. The incident took place approximately 17 kilometres southwest of Kandahar City at around 6:00 a.m., Kandahar time, July 16. Pte Courcy was from the 2nd Battalion, Royal 22e Régiment based in Quebec City, Quebec. He was serving as a member of the 2nd Battalion, Royal 22e Régiment Battle Group. He was evacuated by helicopter to the Role 3 Multi-National Medical Facility at the Kandahar Airfield. “It was with profound sadness that my husband, Jean-Daniel Lafond, and I learned of the tragic circumstances that led to the death of Private Sébastien Courcy, member of the 2nd Battalion of the Royal 22e Régiment Battle Group, based in the City of Québec. While participating in an operation in the Panjwayi District, his unit was attacked by insurgents, and Private Courcy died following the attack. “The challenges facing the Canadian Forces in Afghanistan, which are sadly brought to light once again today, remind us of the extraordinary commitment of our soldiers who are taking part in this demanding and dangerous mission. In spite of the risks, these women and men demonstrate their limitless dedication each and every day. Driven by an unshakeable sense of duty and with their courage firmly in hand, they are pursuing an ideal of justice and freedom, giving the very best of themselves to protect a population in danger, which rightfully aspires to security and dignity. As of Monday July 13, Old Blue a veteran of Operation Enduring Freedom embarked on his second tour in Afghanistan. On his first tour, he was an embedded advisor with the Afghan National Police in Kapisa and Nuristan Provinces. After being trained in the AirLand Doctrine of the cold war he found himself in a counterinsurgency fight; so he had to learn a new way of warfare. He developed such exemplary counterinsurgency (COIN)skills that he was asked to return to Afghanistan to help use his COIN experience to do what he can to help speed success. During his first tour he wrote eloquently about his experiences on his blog Bill and Bob's Excellent Afghan Adventures. When I first stumbled upon his blog I was virtually hypnotized by his ability to convey what he was seeing in words. He is a true Warrior Wordsmith and in my mind one of the most important writers of his time. As US Forces move into the south of Afghanistan, Brigadier General Jonathan Vance says, the Taliban-led insurgency is in "disarray." At a recent press conference at Khandar Airfield, Vance, commander of Canada's joint task force Kandahar had this to say. "Yes, there are times when we take killed or wounded in action, but it pales in comparison to the killed and wounded that the insurgency has taken when facing us. Part of the reason for their disarray is that much of their leadership has been eradicated,"
Since February 2008, the security situation in Kandahar has improved according to polls and informal sources. This comes amidst a growing number attacks against ISAF troops. Effective roadside bomb attacks on coalition forces - those that kill or injure - have more than tripled over the past two years and have set monthly records for the past four months, according to the Pentagon's Joint IED Defeat Organization. Last month, 23 coalition troops were killed - among them two Canadians - while a third Canadian died this month of injuries sustained in a June explosion. More British soldiers have now died in Afghanistan than have in Iraq. Several other Canadian soldiers were wounded in June, although the Canadian military refuses to provide statistics. Brig-Gen Vance said the higher casualty figures reflect the fact that coalition forces are taking the battle into Taliban strongholds in unprecedented numbers. "They are going to places where the insurgency hasn't been attacked in force before and in the process of doing that, your soldiers get hurt and killed - at a rate far lower, I might add, than the Taliban." "IEDs are dangerous," Vance said. "I'm not downplaying the fact that the insurgency has used them to effect against us. I hate IEDs. But it's not going to stop us." One of Brig-Gen Vance's bodyguards was killed a few weeks ago by an IED while the general was visiting his troops in the field which he often does. Hot work but somebody's got to do it. Cheers guys. Mental health conditions and Operational Stress Injuries are not new, but are often misunderstood. In fact, the majority of those who could benefit from help do not even know they need it. This is why I have decided to make this issue a top priority of mine and to encourage you to recognise these as legitimate and serious conditions that need treatment and support. As the CDS I ask all CF personnel to be strong, capable and mission oriented. We all want to be at our best. 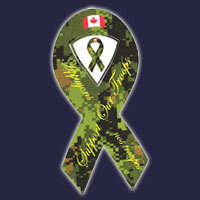 Mental Health problems and Operational Stress Injuries can significantly impact our ability to be at the top of our game and we in the Canadian Forces are not the only ones impacted by these realities. In fact, one in five Canadians will experience mental illness in their lifetime. These conditions are real and in some cases as life threatening as physical illnesses or injuries. They affect the individual, the unit, operational effectiveness, along with family and friends. We all have the responsibility to take these injuries seriously. They require the same care, attention, and support as any other type of injury. We know that clinical and peer based interventions are effective and that the earlier they occur the better the chances are for recovery. Those who receive the support of unit co- workers and leaders have the greatest chance of returning to duty. Therefore, I expect leaders at all levels to create a command climate that allows those who need help to get it. I also expect all CF personnel to foster a social climate of understanding, acceptance and support. Don’t under estimate the impact you can have on someone affected by mental health difficulties. Traditionally, families have been the first to notice the early signs of mental health difficulties and to help our men and women cope. Now that we realise that a supportive work environment can make a big difference let’s make sure we take action. As the Chief of the Defence Staff, I am privileged to lead such dedicated and hard working sailors, soldiers, air men and air women and special forces. You, the men and women of the CF, are the most valuable asset we have. Take care of one another!Be the difference! OTTAWA - The Honourable Peter MacKay, Minister of National Defence and Minister for the Atlantic Gateway, issued the following statement today on the death of two Canadian Forces members in Afghanistan. 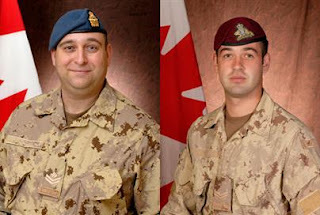 “I would like to convey my sincerest condolences to the families and friends of Master Corporal Pat Audet and Corporal Martin Joannette, who died as the result of a CH-146 Griffon helicopter crash. The accident occurred during take-off near a forward operating base in Tarnak Va Jaldak, Zabul Province, northeast of Kandahar City. 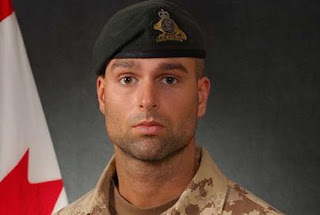 I would also like to express my sympathy to the family and friends of the fallen ISAF soldier, killed in the same incident, and wish a quick recovery to the three Canadians injured. This tragedy demonstrates the great risks involved in this challenging mission. These courageous servicemen gave their lives to secure a brighter future for Afghan families and protect the values of freedom, democracy, respect for human rights and the rule of law. Canada's collaboration and determination to contribute to this UN-sanctioned, NATO-led mission will not waiver. Cpl. Nick Bulger, killed Friday in Afghanistan when his Canadian Forces vehicle hit a roadside bomb, was remembered Saturday as a motivator and committed soldier. More than 2,000 people gathered in the wind and heat of Kandahar Airfield to pay tribute to the 30-year-old married father of two who was on his first tour in this war-torn country. The Peterborough, Ont., native leaves behind his wife, Rebeka, and two daughters, Brooklyn and Elizabeth, as well as his mother, brothers and sister. Bulger, a member of the Edmonton-based third battalion, Princess Patricia's Canadian Light Infantry, is the 121st Canadian killed since the country's mission in Afghanistan began in 2002. 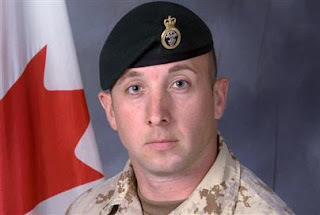 He is the third Canadian to die in Afghanistan in less than a month, all from improvised explosive devices. Let us never forget his sacrifice. May he rest in peace. It only took eight years for some truly good news to come out of the mess that is Afghanistan. Last week, in Deh-e-Bagh, a small village of about 900 people south of Kandahar City, Canada threw a coming-out party to celebrate Operation Kalay, its one village at a time project. And a fine project it is. In Deh-e-Bagh, CIDA, the Department of Foreign Affairs and the Canadian Forces have combined to improve conditions in the town. So far, this village without electricity has received some solar-paneled streetlights, much improved irrigation and road repair. And for the first time in years, local people are employed at reasonable wages to do the work. Future plans include rejuvenating nine mosques, building a road through another nearby village and creating a grain co-operative. Interviewed on TV Saturday night, villagers expressed their approval of the new jobs, new infrastructure and most important of all, new hope. One man pointed out that this village had never wanted to hook up with the Taliban, but had no choice. Now, he said, things are different and we will fight them. Dare we hope that this adopt-a-village approach will succeed where bullets, bombs and air strikes did not? Thomas Johnson, a professor from the Naval School in Monterey, Calif., thinks so. An expert in counter insurgency in Afghanistan for almost 30 years, he toured the village and said: "The Canadians have adopted a very innovative program at the village level, looking at how you can win the trust and confidence of the people." He went on to say: "I think the way we win in Afghanistan is to multiply the Canadian project by about 200." All of this against a backdrop of a reluctant admission from the Defence Department last Wednesday. It released new figures which show the projected cost of the war for 2009-10 is $1.513 billion, compared to the previous estimate of $261 million. Compare that astronomical amount to the cost of adopting a village, which rings in at mere tens of thousands of dollars. And to give the Americans their due, note that Richard Holbrooke, the American special envoy to Afghanistan announced at last weekend's G8 summit in Italy that the U.S. policy of poppy crop eradication will cease. It is, he said, "the least effective program ever." He promised that the U.S. will instead begin "using the money to work on interdiction, rule of law, alternate crops." About time. In the eight years since the U.S./NATO invasion, Afghanistan has come to supply some 90% of the world's heroin -- an increase of 40%. The Taliban, once determined to get rid of poppy crops, quickly realized the potential for income and used the money from heroin production to fund its violent activities. In fact, American crop spraying succeeded only in ruining all crops, thereby alienating farmers and sending them into the Taliban camp. Canadian Brig.-Gen. Jonathan Vance sums up the new approach as a turning point. "We're trying to go from security at the end of a gun, which is defence, to human security. Broad security means re-establishing the economic, political and social fabric." Is it possible we may finally get it right in Afghanistan? Is it possible we can kill the Taliban -- with kindness to the Afghan people.